1. "Who'll say seventy-six? Who'll say seventeen seventy-six? That's the spirit! Seventeen seventy-six!" 2. "Who'll say seventy-six? Who'll say seventeen point seventy-six? That's the spirit! Seventeen seventy-six!" 1. "We foola you good, eh?" 2. "We foola you good, eh boss?". There probably were two versions of each movie, almost definitely one neg for the US and another for foreign release, compiled when each film was made and while it still existed several takes of every shot. 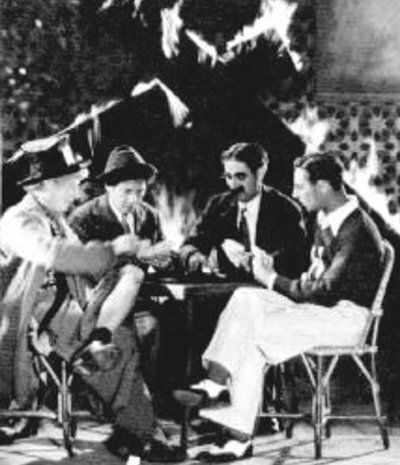 Regarding the Marx Brothers, the existence of several shots is demonstrated for example in the radio and movie trailors of Duck Soup, consisting entirely of rejected takes. The alternative versions of Horse Feathers and Duck Soup shown in the 1960s and 1970s were probably the foreign negs. That would explain why Allan Eyles in The Marx Brothers - Their World of Comedy quoted differently from Anobile. Sandhu last saw the alternative versions in about 1975 or 1976 and never since. The prints currently in circulation shows that Anobile's transcriptions were exact. Has anyone examined the Italian or French dubs of the Marx's films? A frame-by-frame comparison with the current home-video English versions would probably be revealing. This is food for thought which hopefully will serve as a catalyst for someone to sift through film collections and seek out variant versions.